TwtrSymphony will release their debut track The Hawk Goes Hunting Friday July 6th, 2012.Hawk is the 1st movement of Chip Michael's Symphony No. 2 -Birds of a Feather, a new composition created specifically for a Social Media Symphony. TwtrSymphony, a new concept in the symphony orchestra, would only be possible in our modern era of global communications. 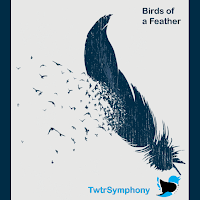 A collection of musicians from around the world met over Twitter and conspired to form an orchestra participating in the TwtrSymphony project. This newly formed organization works to create new music in keeping with the character limit of a tweet - 140 seconds at a time. Six talented composers participated in the 21st annual Underwood New Music Readings -- ACO's roundup of the country's brightest emerging composers, June 1-2. George Manahan conducted new music by Ryan Chase, Peter Fahey, Michael-Thomas Foumai, Paul Kerekes, Pin Hsin Lin and Benjamin Taylor. Several composers blogged about their experiences. (Check below.) Next month we will announce the winner of the coveted $15,000 Underwood commission. Today we are proud to announce that Ryan Chase is the winner of the Audience Choice Award with his thrill-ride, The Light Fantastic. Every audience member who voted will receive a newly composed ringtone from the winner. Congratulations Ryan! I just finished reading Michael Kaiser's "The Art of the Turnaround --creating and maintaining healthy arts organizations." It's a wonderful read for anyone interested in promoting the arts. As a composer, my interest lies with Symphony Orchestra's, but Michael's experience is applicable to any arts organization.